A photograph of movie stars Ranveer Singh and Deepika Padukone posted by a Facebook page has created quite a frenzy among the netizens. The photograph shows the two sporting saffron scarves on which "Vote for BJP N Modi" is printed. The text accompanying the image campaigns for the BJP and urges viewers to "press the lotus button ( and) become a part of the nation’s progress." The page has a rather modest following of a little over 36,000 but the photo has been shared over 4000 times already. However, it is now being reported that the photo is digitally altered. 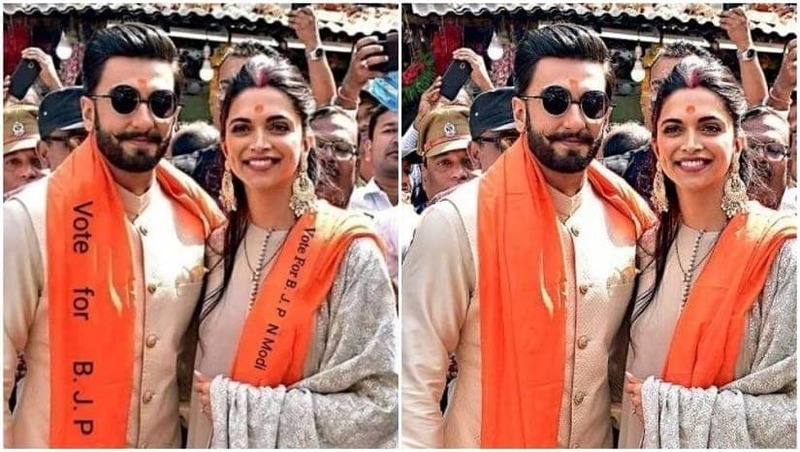 The original picture was taken when Deepika and Ranveer visited Siddhivinayak Temple in Mumbai on 30 November, 2018 days after their wedding. The original photos shows them wearing plain saffron scarves. As India heads to the 2019 Lok Sabha elections, tension among the political parties is heightened. The two major parties of the country, the Congress and BJP, have been campaigning relentlessly over the past few months to woo voters. The elections seem to have created a conflict among the entertainment industry as well. Last week, more than 600 theatre personalities signed a letter urging people to "vote BJP and its allies" out of power, arguing that the idea of India and its constitution are under threat. In a counter, 907 other artists on Wednesday issued a statement speaking for the incumbent government's re-election.